Great for beginners who have never used a decorating bag and tip. Perfect for left or right-handed decorators. 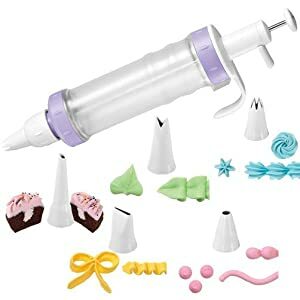 Use the Dessert Decorator Plus to decorate cupcakes, cakes and cream or custard filled desserts. Clear barrel holds 1 to 1½ cups of icing, filling or whipped cream. Includes 5 decorating tips. Easy to control thumb lever controls flow. Decorate with the large round tip, leaf tip, a star tip and a petal tip. With this selection of tips, you can make elegant shell borders, stars, rosettes, leaves, bows, ruffles, and a multitude of flowers. 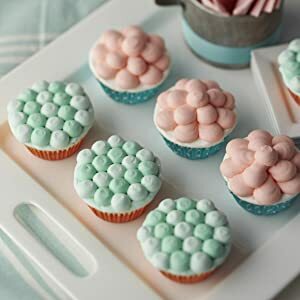 Tips are easy to change, so you can use the same color icing to make stars, then switch to a dot with a simple twist and swap. The pull-out plunger eliminates icing waste as it scraps the edge of the barrel like a spatula as you decorate. Plus, standard Wilton tips can be used with the Dessert Decorator Plus, so your options are limitless. 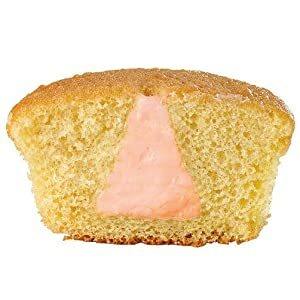 Surprise Fillings Are Easy Too! 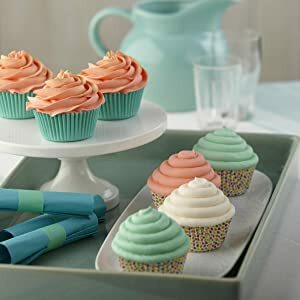 Use the bismark tip for filling cupcakes and other treats.